Few weeks back I managed to find and purchase some 16g stainless steel wire (soft). Been looking high and low for this wire for a while. You know wire of this size (especially soft one) is really hard to come by so I was very tempted to buy the whole coil. On the other hand, I have lots of 16g hard stainless steel wire but they are really tough to work with, if not near impossible (for me at least). I think I mentioned this before, so just bear with me. DH use them for his fishing "accessories" and of course arms and fingers are stronger. Back to this bookmark, I find that this wire size is the best for this kind of wire bookmark. Thinner wire will feel very flimsy even with hammering. 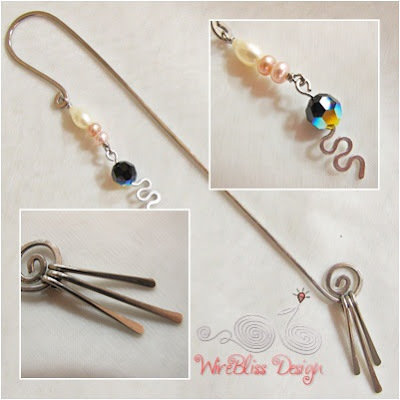 With hammering, this bookmark is very sturdy and would withstand your reading habit. This one is adorned with pearl and 8mm Swarovski Crystal and the bottom part with 3 short hammered wires. Labels: Bookmarks , Wire Jewelry Share it! Great book mark Mei...I've never used stainless steel wire, but I do know we have a Canadian company that sells 1/4 hard 16 gauge stainless steel wire...don't know if that would be soft enough? Maybe just give it a try to find out. Mei, where did you manage to find the 16ga stainless steel soft wire? I've been looking for some myself!